The Urban Canaries explore new ways of tackling air pollution through a pollution sensor whose own health is depending on its exposure to clean air. According to the World Health Organization, air pollutants have become the top environmental risk to the health of children since their immune systems and lungs are not fully developed yet at the time the exposure begins. Years ago coal miners would carry canaries down into the tunnels with them. The delicate birds were more sensitive than humans to dangerous gases like carbon monoxide. If the birds perished, the miners knew it was time to exit the tunnel immediately. Drawing inspiration from the concept of the coal miner’s canary, the Urban Canaries are small, portable pollution sensors whose own health gets affected by the pollution they sense. While accompanying the child on her daily routines they continuously measure the air quality nearby to alert the child in case of air pollution. As the child’s health, their own health also suffers from continued exposure to polluted air. 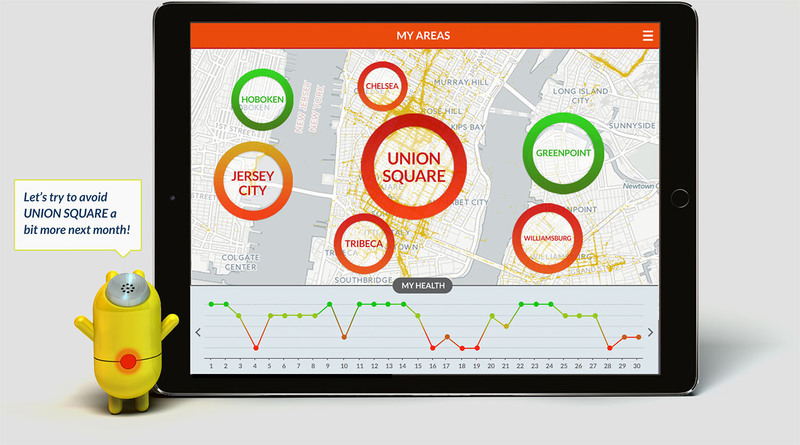 Once ill, the Urban Canary can be examined using the parents' smart phone to gather more information about the cause of the illness and learn of ways to heal the Urban Canary. Rather than simply translating measured data into visuals, the Urban Canaries facilitate new conversations between parent and child that help to avoid inner city air pollution in the future. When the Urban Canary is first given to the child, it is healthy and well, indicated by its steadily blinking green pulse. Over time though, as the child’s own health, the Urban Canary’s health becomes affected by prolonged exposure to higher levels of pollution. Changing with continued exposure to pollutants, the color of the Urban Canary’s pulse gives a constant visual indication of its health and recent exposure to pollutants. Depending on the child’s age, general health and inevitable exposure to low levels of pollution in the urban environment, the sensitivity of the Urban Canary to pollution can be adjusted in the settings. 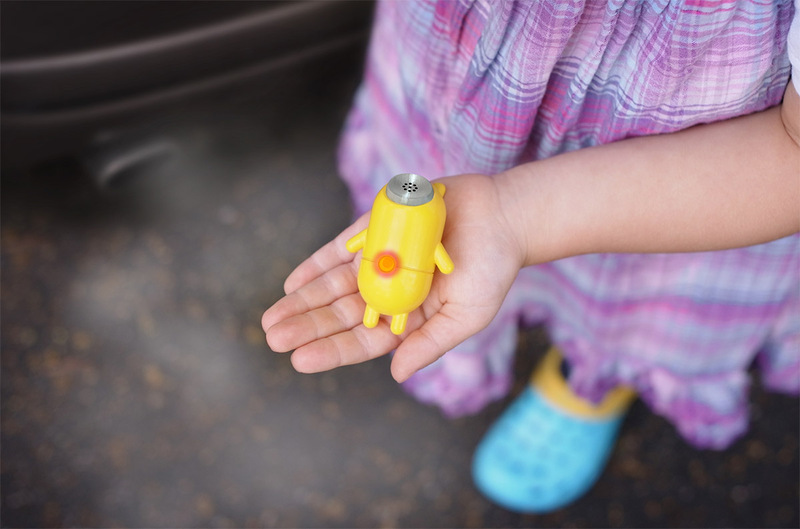 While accompanying the child throughout her daily routines, the Urban Canary constantly monitors the air quality level around them. 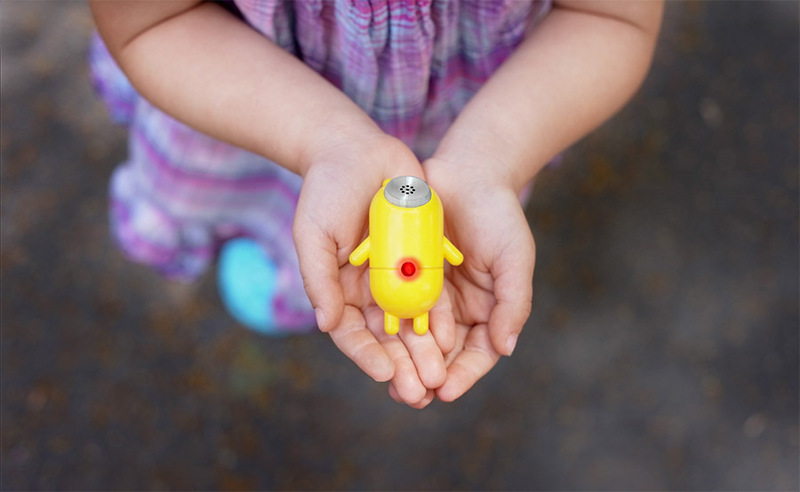 Whenever it senses high levels of pollution, the Urban Canary starts to get uneasy, anxious and, as expressed through its LED and vibration, alerts the child of nearby air pollution. 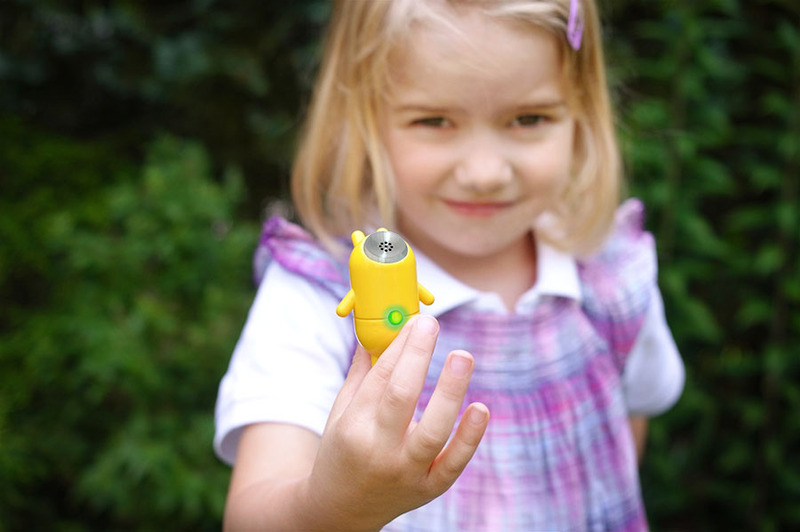 When sensing extremely high pollution levels, the Urban Canary not only alerts the child, but further sends a call for help to her parents. If exposure to high levels of pollution continues to occur over longer periods of time, the Urban Canary starts to become ill, indicated by its pulse slowly changing color. When ill, the Urban Canary can be scanned with the parents' smartphone to examine it and find out what led to it falling ill. It will recount its recent encounters with polluted areas and state the occasions where and when it and the child were exposed to pollutants. For more detailed information, a summary shows the areas, times, and amounts of pollution that both the Urban Canary and the child were exposed to throughout their daily activities. Together with the parent, the recent exposure to pollution can be discussed, and helpful advice can be given. 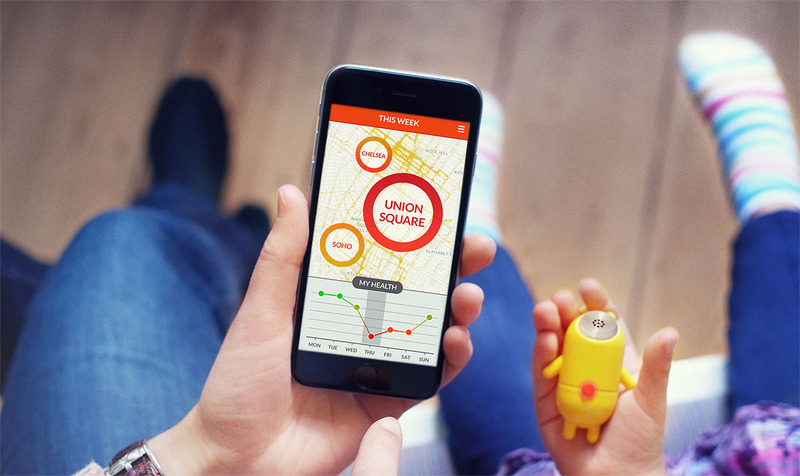 By accompanying the child continuously on her routines, over time, the Urban Canary collects all the areas that have affected its health in the past. Utilizing this information, it can provide helpful recommendations on how to avoid excess pollution in the future. In their connected network, the Urban Canaries look out for each other and suggest unpolluted spots nearby to recover. By sharing their measurements with each other, they create a comprehensive pollution map that can be used to spare children and their Urban Canaries from excess pollution in the future. 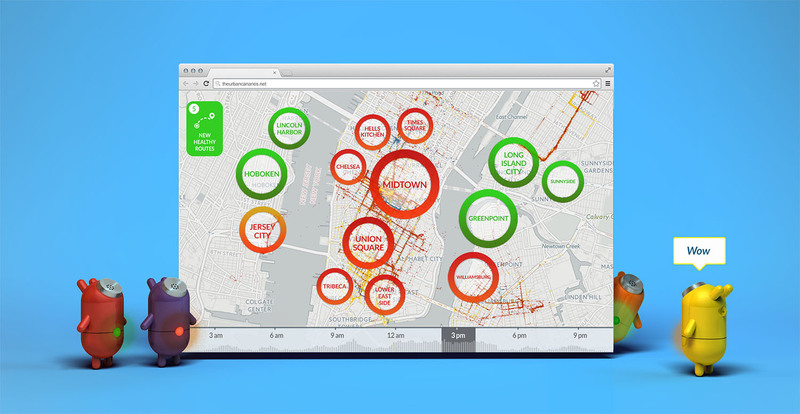 The map gives a good indication where the Urban Canary’s health may suffer or improve at which time of the day, so it (and the child) can avoid polluted areas nearby or find spots to take a breath of fresh air in between. When exposed to unpolluted air, an Urban Canary recovers quickly, indicated by its pulse changing color back to its original bright green. 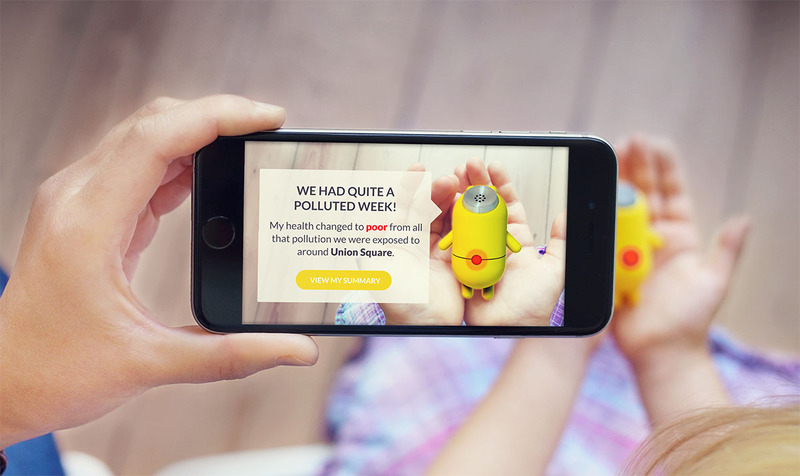 The Urban Canaries - Utilizing playful relationships and emotional attachment to create new conversations around air pollution between child and parent.